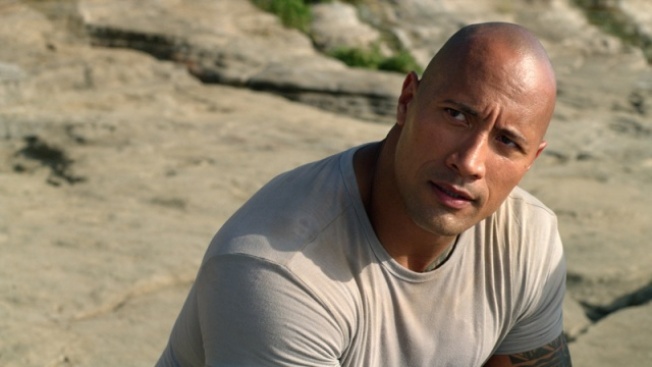 "Journey 2: The Mysterious Island" seeks to test the hypothesis that any film can be made 20% more awesome by the addition of Dwayne "The Rock" Johnson. Brendan Fraser starred in the 2008 hit "Journey to the Center of the Earth," alongside Josh Hutcherson. This new film finds The Rock subbing in for Fraser, playing Hutcherson's stepfather who joins him on a quest to find Jules Verne's "Mysterious Island." Hutcherson plays Sean, the latest in a long line of "Vernians" (a word Hutcherson utters with a grating frequency), people who take the works of Jules Verne to be fact rather than fiction. One night Sean picks up a coded radio signal that he believes comes from his long-missing grandfather, Alexander Anderson (Michael Caine in a positively Caine-ian moneygrab). After much fussing, The Rock finally agrees to accompany Sean on a trip halfway around the world to where he believes the signal came, an island in an area so remote and treacherous that only Gabato (Luis Guzman) and his daughter, Kailani (Vanessa Hudgens), are willing to fly them there. After an unpleasant encounter with a nest of gigantic lizard eggs, the adventurers find Alexander, who brings them to his Gilligan-esque home, and tells them an incredible tale about island's treasures, including a certain lost city and a legendary submarine. It seems churlish to complain about the physics of a film that features miniature elephants and giant bees, but for the love of Pete, there are standards! The idea that Hutcherson could get thrown from his apian steed and bounce along the ground a dozen times, like a rock across the surface of a pond, and emerge with only a sprained ankle is absurd. And what happened to Guzman? The talented and beloved character actor here is reduced to a stream of scatological gags and assorted indignities that could only amuse pre-teens. While it's far from the most disgusting, maybe the saddest moment is when The Rock begins popping wild berries off his pecs, right into the eyes of the 3Dgoggled audience, before launching his final shot into Guzman's mouth. Who is this good for? The effects look cheap, the humor is beyond lowbrow, and "Journey 2: The Mysterious Island" asks for far more than the standard suspension of disbelief. At least it's short.